Drama. There are no “bargains” in the stock market and shopping in the basement for the end-of-the-line and bespoke brands has cost investors ($7.7 billion) last year for an aggregate return of minus (-52%) and another ($8.6 billion) and minus (-38%) so far this year as they hang-on or maybe “double-down” for a better outcome. The current market price for all five of the stores – and a lot of employees, customers, debt, inventory and real estate – is $14 billion and that’s only 1/2 of the price of risk ($28 billion). 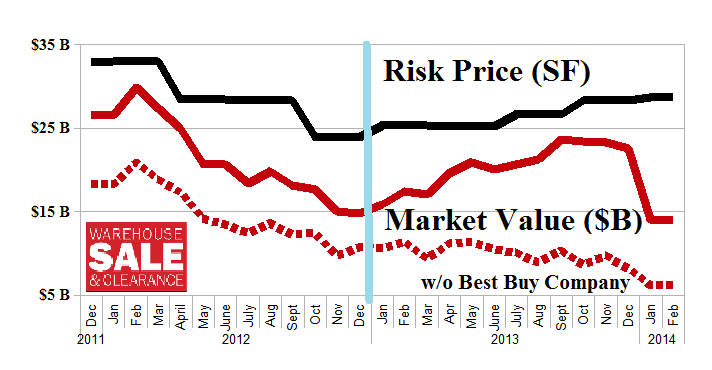 We’ve included Best Buy Company Incorporated but the jury is still out on that (Business Wire, January 17, 2014, Investor Alert: Best Buy Co., Inc. Investigation Announced by Holzer & Holzer, LLC). Please see Exhibit 1 below for the scary fundamentals. These stores could be called a “value trap” for small investors but they are a “liquidity trap” for large investors and it is they – entrepreneurs, institutions and hedge funds – who will determine the buying and selling price for these stores. The solution is to buy them all, job the inventory to Amazon and the Dollar Stores, and deal with the debt, pension plans, severance, and all the real estate.